You taking herb? It would not work! Now, the herb works! LF is 51-year-old lady. In September 2015, she had bleeding every day. She went to a GP. USG was done but the doctor found nothing wrong. She was given hormone pill to take. She also took supplements. They seemed to help. But, her problem did not go away. LF suffered heavy bleeding and this made her go and consult a gynaecologist. She was given some medications but they were not effective. Then, her stomach became bloated. She consulted another GP who told her it was cancer. Eventually LF was referred to a private hospital and did a CT scan. And there it was a mass of soft tissue, measuring 5 x 3.8 x 4.3 cm on the right side of the lower abdomen/pelvis. There was also fluid in the lungs and abdomen (pleural effusion and ascites). The ascitic fluid contained malignant cells with features suggestive of metastatic adenocarcinoma. LF underwent surgery immediately. It was a total hysterectomy and bilateral salpingo-oophorectomy. The appendix and omentum were also removed. According to the histopathology report, it was a well-differentiated endometriod adenocarcinoma of the uterine corpus. Stage 1A. 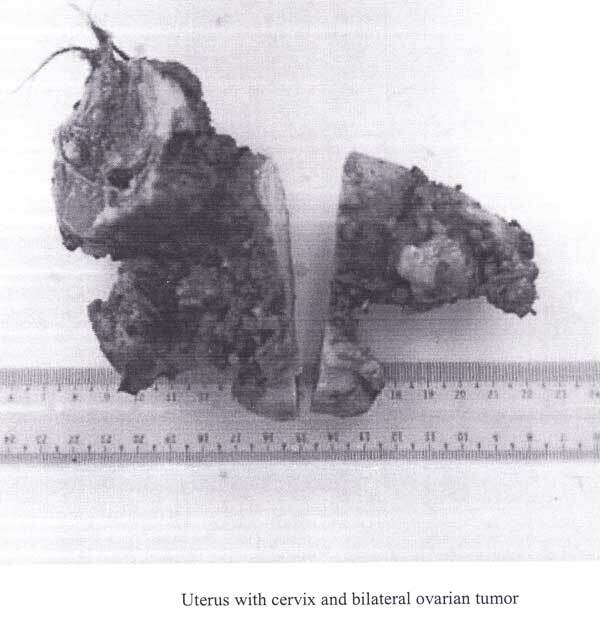 In addition, LF also had a left ovarian tumour with metastasis to the omentum. It was at least stage 3A cancer. LF was told to commence with follow-up chemotherapy 3 to 4 weeks after the surgery. LF decided not to undergo chemotherapy. She took Sabah Snake grass (SSG) instead — 70 leaves, twice a day. CT scan done in August 2016, showed enlargement of the para aortic lymph nodes. There was no free fluid in the pelvis. Her CA 19.9 was at 322.6 before the surgery and this dropped to 30.3 after the surgery. A few months later it went up to 35.0. Her CA 19.9 also increased from 29.7 to 69.9 and progressed to 105.6 (see Table below). It was at this point in time that LF decided to come and seek our help. She presented with abdominal discomfort and severe numbness of the legs. Less than 3 months on the herbs, her health improved! Her abdominal discomfort disappeared and the numbness of her legs was almost resolved. Of course, she had stopped taking the SSG. On 9 August 2016, her CA 19.9 was at 105.6 and after taking the herbs, on 2 November 2016, her CA 19.9 was 30.0 (within normal range). One lesson we can learn from this case. LF’s husband told me this. I went to have the blood test done in my friend’s lab. I told him, My wife is taking herbs and does not want to go for chemotherapy. The doctor said, Herbs will not work! Three months later, this same doctor said, Yes, now the herbs work! Because the CA 19.9 came tumbling down from 105.6 to 30.0 (normal range). Good news also comes with “bad” news! LF expressed her concern that she might have to go back to teach now! Why? Because her blood test showed she was normal! Besides that, disaster may also follow good news! LF may believe that she is really “cured” and will become complacent! She may go back to the previous life style and eat what she likes! I warned LF — The cancer will come back again if you do that! There is no cure for cancer. There is no question, that LF’s cancer is serious. It has spread. Feeling better and the CA 19.9 came down to 30 does not mean that she is cured. Ovarian Cancer: Operation but Refused Chemotherapy. Five years on still healthy! This 52-year-old Indonesian lady was diagnosed with ovarian cancer in June 2011. She underwent surgery to remove both her ovaries. It was a papillary adenocarcioma, Stage 1C. The operation was a success but the patient went into coma for 3 days due to electrolyte imbalance. After she regained consciousness there was still bleeding. She had to undergo a second operation to “mop up” the complications. Patient was asked to undergo chemotherapy but she refused. 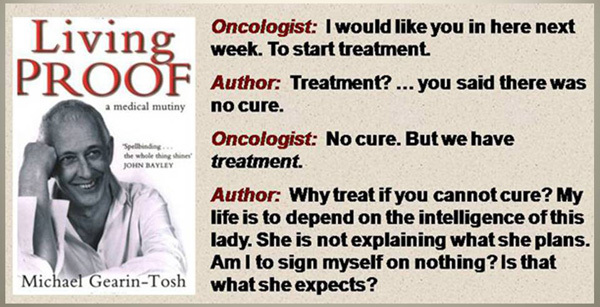 Why did you not want to go for chemo? Did you know anything about chemo? My mother had cancer and underwent chemotherapy. She suffered badly. I am not afraid to die but I don’t want to suffer. Were you not under pressure from others around you for not wanting to go for chemo? Yes, Everyone said, if you have cancer you must go for chemo! And you did not waver and was firm with your decision? Yes, because I have God with me. Oh, you prayed to God and asked for His guidance? What did God say to you? You are here (at CA Care) NOT by accident. Patient came to CA Care in August 2011 and it has been 5 years now and she is doing fine. During these 5 years she did not encounter any problem! In the initial stage she was under pressure to undergo chemotherapy but since she has been doing so well, no one ever reminded her again to go for chemo! The author, Sarto Shickel is a graduate of Cornell University with a Bachelor of Science degree and the University of Pennsylvania with Masters in Architecture. He is a partner in Philadelphia architecture and design firm and a passionate advocate of natural healing through organic, whole foods nutrition. Sarto grew up on a dairy farm but later embraced a healthy plant-based diet about 27 years ago. 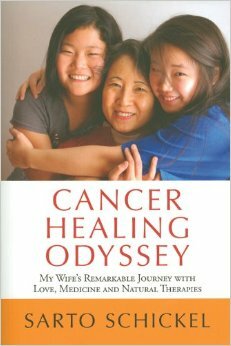 The book, Cancer Healing Odyssey, tells the story of a Korean woman Sun Hee Lee, married to Sarto, who was suddenly diagnosed with ovarian cancer stage IV, and already with malignant pleural effusion. In September 2007, Sarto Schickel’s wife, Sun Hee Lee, had a bad cough that which she hoped was bronchitis and not something more serious. She also had a bloated abdomen and some shortness of breath. At the time of diagnosis, the ovarian cancer had already spread from the abdominal cavity to the chest cavity, where she had a large fluid build-up called a malignant pleural effusion, and a partially collapsed right lung and it has spread to the liver as well. It was the shock of a lifetime. Sun Hee is the mother of two young daughters and wanted desperately to live. Sun Hee looked at all her options and decided to have surgery, and later agreed to the Gerson therapy, to chemotherapy (she did 8 sessions of Carboplatin + Taxol) and to some macrobiotic dietary influence. In essence, she created her own unique integrative program for cancer, with her husband’s guidance, after visiting and consulting with conventional and alternative doctors and a macrobiotic counselor. In fact, Sun Hee began an alternative nutritional and detoxification therapy the very next day after confirmation of diagnosis on 27 Sept 2007. On October 15, she had abdominal surgery to remove the primary ovarian tumour and she continued her nutritional and detoxification therapies for six weeks after surgery. She then continued an adjusted alternative nutritional program while receiving a total of 8 chemotherapy infusions over the next seven months. Four and a half years later (the book was released in 2011 with second printing in 2012), Sun Hee is living a normal life, a rare outcome in medical history. (Stage 4 Ovarian cancer with malignant pleural effusion carries a poor prognosis). This combined integrative approach was critical in Sun Hee’s recovery. Sun Hee did not ever consider relying solely on conventional cancer care as the statistics seemed to indicate that the result would almost certainly be death. However, after having surgery and 8 sessions of chemotherapy, Sun Hee declined her oncologist’s suggestion to undergo another 12 additional maintenance chemotherapy treatments…”to keep the cancer from re-growing.” The oncologist did admit that…”eventually the cancer would come back even if more chemo was used.” When Sun Hee pressed what would come after the maintenance chemotherapy, the oncologist then indicated that they would keep giving chemotherapy until the body could no longer take it. The above proposal and comments by her oncologist left Sun Hee in a state of shock and more so when he retorted to her….”Now is not the time for alternatives.” The very thought of further chemotherapy was most undaunting to her. During each of her previous 8 chemotherapy sessions; she was devastated physically and emotionally. She suffered side effects such as exhaustion, hair loss, tingling in her hands and feet, leg heaviness between ankle and knee, black and blue spots on the legs, chest pains, nausea and general heaviness in the chest region. Sun Hee is a living example of what progress can be achieved when nutritional and detoxification therapy is combined with conventional treatments. According to Mr. Sarto, the logic of embracing an alternative and detoxification program….regardless of what essential treatments one may choose from the field of conventional medicine—one must still eat and drink—so why not eat and drink the ideal food and drink that one can to help the body’s immune system. This can help to fight the cancer—from the inside out—to achieve authentic healing. Sarto’s final advice to all cancer patients is….”do not wait until you have been through two years of conventional-only medicine, and are on your death bed, before trying nutritional approach or other therapies.” Most cancer patients are never told that careful nutritional change may save their life. In addition to a very compelling personal story, the book includes medical reports, four x-rays showing the complete disappearance of the pleural effusion, a summary of CA-125 blood test results (the ovarian cancer tumor marker) as well as the recipes she used during the various phases of her recovery. The book is meant to give hope to others by showing how one woman overcame the odds through love, medicine and natural cancer therapies, including a lot of time in the kitchen preparing the organic whole foods and juices that were the backbone of her integrative nutrition. Sun Hee’s healing from Stage 4 ovarian cancer is very similar to Olivia Newton-John’s recovery from breast cancer. This clearly shows that one can carefully combine conventional medical treatments, such as surgery, and even some chemotherapy, with alternative dietary and detoxification methods, together with positive mind and spirit practices. Where does all the oncologists’ theory of “clashing” comes in? A lot of bull isn’t it? We welcome your comments. 1) There are a lot of information on the Gerson therapy and the macrobiotic dietary system—just google them. Ovarian Cancer 2: After Recurrence She Again Refused Chemo. Why? Lucy was asked to undergo chemotherapy after the cancer had recurred. She again declined and came to seek our help on 7 September 2012. We cautioned Lucy to seriously consider undergoing chemotherapy. After all the cancer had spread and she should not expect much from us. Also, please don’t blame us if things don’t work out the way she wanted! She was not receptive to chemo. Listen to our conversation that day. The doctor in the government hospital asked Lucy to undergo chemotherapy immediately. She hesitated and asked for some time to think over it. The doctor also queried why she did not do chemotherapy the previous year after she had the surgery. Lucy asked the doctor what would happen if she do not want to do the chemo. The doctor said he would not see her again if she declined chemo this time. Next time when it becomes serious, sorry! Don’t come and see me. In spite of this stern warning, Lucy was adamant and refused chemotherapy. She came to seek our help on 7 September 2012. Chris: Okay, let me ask you. You have been taking the Sabah Snake Grass – did it help you? Lucy: If it helped me, I don’t have to come and see you anymore. See, the good of this plant has been published widely in the papers! C: The problem is just because it is published in the newspapers, you beiieve it all. I never read the newspapers these days. My herbs would not cure! Why don’t try chemo then? Please don’t blame me if things don’t work out the way you want! From my reading, surgery does not cure ovarian cancer. It can recur if you don’t take care properly. Chemo does not cure ovarian cancer. If you take herbs, it is not going to cure you either! 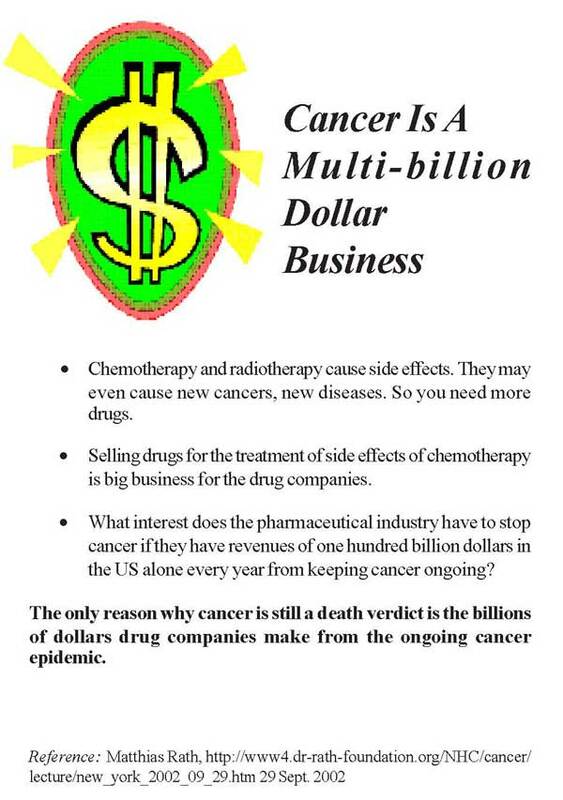 So why not try chemotherapy! Perhaps it may help you temporarily. If you take my herbs, and if the results did not meet your expectations, you will blame me. And if you face any problem you will blame the herbs. The reason why I say this is simple. The cancer has already spread rather extensively. From my experience, nobody in this world can cure cancer! 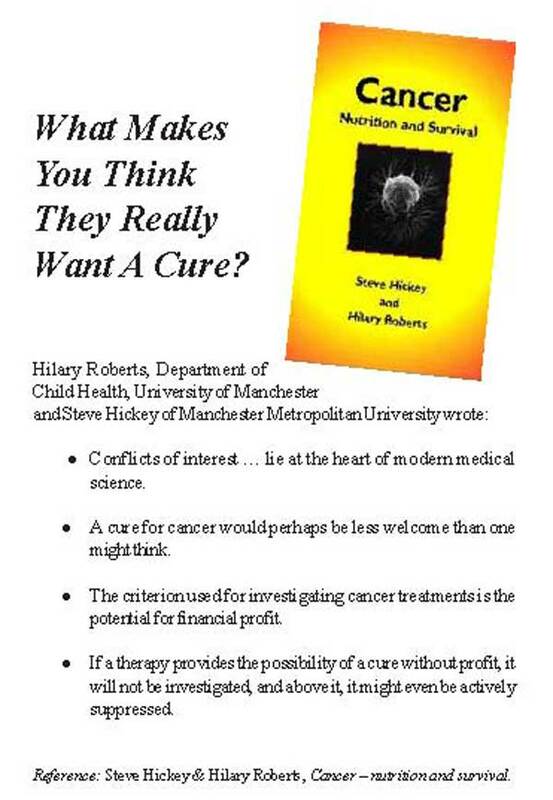 (Cure means cancer is totally gone and will not come back ever again). I suggested that Lucy go back and think about it. Lucy was again adamant. She said, Today I come here, of course, I am not going to go for chemo. And of course, I am not going to blame you if something went wrong. Lucy admitted that before this she had been taking all kind of food. After meeting us, she decided to take care of her diet and change her lifestyle. Yes, this we hope she would do! Why Do You Not Want to Undergo Chemotherapy? I did not ask Lucy specifically this question. It was not one year later that I got to meet up with Lucy and learnt the answer to this question. Lucy had a friend who underwent surgery and then chemotherapy. After the treatment – and after much suffering from the side effects – the cancer came back again. So according to Lucy, why go for chemo if it would not cure? Why go through all these and suffer? Then probably more relevant was her father’s experience. Lucy’s 60-yer-old father had nose cancer. He underwent radiotherapy and then chemotherapy. After two cycles of chemo, he was not able to withstand the treatment anymore. The family stopped the treatment. One month later, he died. To this I told Lucy, I understand you. Those who do not know anything about chemotherapy could not understand Lucy. If you have a family member or close friend undergoing this treatment, there is no need for anyone to say much. You know the difficulties and agony. I too have not gone through such experience but from my readings, I learnt from other people’s experience to be able to know what it is like. Some told me it was HELL. The following are information and data obtained from the internet and oncology text books regarding ovarian cancer. Around the world, more than 200,000 women are estimated to develop ovarian cancer every year and about 100,000 die from the disease. According to the National Cancer Registry, ovarian cancer is the fourth most common cancer among women in Peninsular Malaysia, making up five per cent of all female cancer cases. Epithelial tumors represent the most common histology (90%) of ovarian tumors. This type of cancer often spreads on the peritoneal surfaces – e.g., undersurface of the diaphragms, paracolic gutters, bladder, surface of the liver, mesentery and serosa of the large and small bowel, omentum, uterus, and para-aortic and pelvic lymph nodes. Most ovarian cases are diagnosed in an advanced stage and their prognosis is closely related to the stage at diagnosis. Overall, prognosis for advanced-stage patients remains poor. Overall 5-year survival of ovarian cancer is 45 percent. As I have always told patients – we don’t have to believe this statistics but we also don’t want to bury our heads in the sand and pretend that everything will be okay. We need to know the reality and then try hard to beat the odds. Currently, the standard treatment for stage 3 ovarian cancer consists of both surgery (surgical debulking) and chemotherapy. Unfortunately, less than 40% of patients experience long-term survival following standard treatment. Approximately 60-80% of patients with stage 3 cancer will experience a recurrence of their cancer, even after complete surgical removal of cancer. Nearly all patients with stage 3 disease have small amounts of undetectable cancer that have spread outside the ovary and were not removed by surgery. These cancer cells cannot be detected with any of the currently available tests and are referred to as micrometastases. The presence of micrometastases causes cancer recurrence. The chemotherapy drugs used to treat ovarian cancer are fairly standard. Typically doctors combine a platinum-based drug such as carboplatin or cisplatin with a taxane such as paclitaxel (Taxol) or docetaxel (Taxotere). Perez, C.P. et. al, (in Clinical Oncology, 8th Edition, Health Science Asia, pg. 489) wrote: The combination of paclitaxel plus a platinum compound is considered by most to be the first-line adjuvant chemotherapeutic regimen in patients with advanced ovarian cancer. 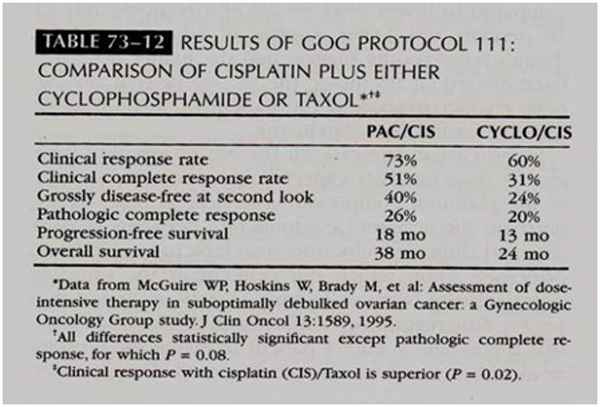 The pathologic complete response is only 20 to 26 percent (Table below). Ovarian cancers are very sensitive to chemotherapy and often respond well initially. Unfortunately, in most cases, ovarian cancer recurs. Fewer than 20% of patients treated with a platinum compound and paclitaxel survive without evidence of cancer recurrence 5 years following treatment. Unfortunately, even in patients who respond, the disease eventually becomes resistant to the first-line drugs, and the cancer returns. Some ovarian tumors are resistant to platinum drugs. Once cancer recurs or continues to progress, the patient may be treated with more chemotherapy. Despite the development of several new chemotherapy drugs over the past few years, there is no substantial evidence that any of the treatments have increased the number of women cured of ovarian cancer. Gemcitabine (Gemzar) is also used in combination with carboplatin for women with advanced ovarian cancer that has relapsed. Other drugs include doxorubicin (Adriamycin, Doxil), etoposide (Vepesid), and vinorelbine (Navelbine). Chemotherapy can cause side effects during and after treatment. The type and severity of these side effects depends upon which chemotherapy drugs are used and how they are administered. The most common side effects are nausea, vomiting, mouth soreness, temporary lowering of the blood counts, and hair loss. At the end of treatment (both surgery and chemotherapy), a patient is considered to have a “complete response” if her physical examination is normal; there is no evidence of cancer on imaging studies (such as a CT scan); and the blood level of the tumor marker like CA-125 is normal. However, even when all of these criteria are met, microscopic amounts of residual cancer (i.e., not visible on imaging studies) can still be present. Growth of these microscopic tumor cells is probably responsible for tumor recurrence at a later date. To monitor for the possibility of recurrence, blood tests, physical examinations, and imaging tests are to be done. The likelihood of a tumor recurrence is highest in women with more advanced-stage disease at diagnosis, particularly if the initial debulking surgery was unable to remove all visible tumor. The earliest evidence of recurrent ovarian cancer can be indicated by a rising blood level of one of the tumor markers (CA-125) and symptoms such as abdominal pain or bloating with or without back pain, or presence of pelvic mass. What Can I Expect After Chemotherapy Treatment? Surgery plus chemotherapy drugs can get rid of ovarian cancer, but often they can’t keep it away forever. Surgery and chemotherapy are usually effective in treating the cancer so it will go away for a while, but in most cases the cancer ends up coming back. Often, the cancer will return within one to two years after treatment is finished. If the cancer does return, another round of chemotherapy is necessary. Lucy was asked to undergo follow up chemotherapy. She declined. She said, I did it my way and went for traditional method. She embarked on taking Sabah Snake Grass (SSG) since much has been said about its goodness in the local mass media. Lucy started with 300 leaves but when she began to have joint pains, she reduced the consumption to 30 leaves each time. Lucy had been taking this fresh herbs for more than a year – from May 2011 until September 2012 (when she came to seek our help). In May 2012, Lucy had lower abdominal discomforts and did an USG. The result indicated a possible presence of a mass in the Pouch of Douglas. The echodensity measures 3.3 x 3.6 x 5.2 cm. She went to consult three doctors. Doctor 1 said there was nothing wrong! No mass. Doctor 2 said there was something in there but unsure of what it was! Doctor 3 also said the same – something in there! Knowing that her cancer had recurred, Lucy started to take the SSG again and this time more seriously at 300 leaves each time. a heterogenous mass – 5.3 x 4.0 x 4.4 cm – at the pelvis suggestive of tumour recurrence. possible infiltration into the adjacent sigmoid colon and right pelvic nodal metastasis. enlarge lymph node along the right pelvic – largest 1.9 x 1.1 cm. the peritoneal soft tissue nodule – 1.4 x 1.2 cm – may represent peritoneal metastasis. Sabah Snake Grass (SSG) is not new to me. I know this plant since 1995 when I started CA Care and has been using it as one of the 350 herbs used in our centre. However what is new to me is the idea that only ONE herb is used as if it is a magic bullet. This unfortunately is against the basic principle of herbal therapy. Nevertheless this is what happened when one has a “magic bullet” mentality. Hi Dr. Chris, recently I read from newspaper regarding Sabah Snake Grass (Clinacanthus) herb which can help in cancer treatment. Do you have any comment on this … for cancer? Recently, I met a man who had Lymphatic Cancer – Stage 4 with lymph nodes affected. His cancer started in March 2008. After 9 chemo therapies he stopped the treatment on 10/11/2008 because 5 specialists said he can only survive for 3 months. Today, after more than 2 years, he has recovered and is still living. Thanks to the Sabah Snake Grass (Clinacanthus) which he planted outside his house. He blended the leaves with green apple (minus skin and seeds) and drank them after breakfast every day. After 3 days, 6 tumours disappeared. After 13 days, he went for a blood test. The oncologist said that he was 96% cured. So far more than 200 people who had taken the herbs showed improvement. Case 1) Man – age 54, Lung Cancer: 3rd stage. Scheduled for surgery. After taking SSG, reduced to 3.5cm. Doctor said no need to operate. Continue taking the SSG, the tumour disappeared. Case 3) Man with Prostate Cancer. Both breasts removed – 4 stage. Very weak, cannot eat, on drip and lying in hospital. Family member poured SSG juice into her mouth through tube. After a few days, could eat and was discharged. 28 days later was all tumours disappeared. So far 4 cases have been cured after drinking SSG juice. They also drank juice from 3 leaves of Guo Sai Por (Ti Tham Tou) once per week. Scientists in Thailand have been studying this plant. There is also a company making cream from this plant. I also grow this plant in my garden for many years already. I also use this plant for cancer but not in the way it is being publicised much less getting “instant, magic” results as claimed. Does the plant really cure cancer like written above? I HOPE IT IS TRUE … but I am not sure and it is very, very difficult for me to believe such stories without clear, hard evidence. Let me say it clearly: I want to believe these stories but I cannot. My training as a scientist just tell me it does not make sense – they are too good to be true. As a scientist, I also find such claims more of a “joke.” Nobody with a scientific mind would be able to swallow such success stories as the way these are written! Let me say it here — I am not saying they are not true but what is questionable is the way the stories were written and presented. I am sorry to say this but I still have to say it. But unfortunately many of us only want to hear what we want to hear, throwing away logic and common sense out the window. In this video, a lady related her experience with SSG. She had been taking it for over a year and she suffered a recurrence. SSG could not even prevent a recurrence let alone make tumours disappear. The above patient is not the only one who experienced such failure. I have many others who came with similar failed stories. I have also personally given SSG to a lady with small lumps in her breast. The leaves were harvested from the plants that I grew at home. I asked her to take the juices every day. It did not work. She had to go for chemotherapy. Let me be clear about this. I am not against anyone taking SSG. By all means take it if that makes you happy or feel good. Take it if you benefit from it. You could be the lucky one. After all you don’t have to sell your house to pay for the herb. So there is nothing much to lose. But if you have problems after taking it, you may want to stop taking it. Some patients told me that they experienced joint pains or muscle cramps and could not walk after taking SGG. Again, this can happen to some people, while others have no problem. To those of you out there. Let me know if you have any good healing stories about SSG. As a reminder, whenever we want to make any claim of efficacy, we must present our case with a certain degree of credibility. Our story must be substantiated by medical reports, CT scan, blood tests, etc. Let us document such success stories properly so that others would not laugh at us. Shoddy work makes us look cheap! We give others all the reasons to say we are quacks. Let us do our work correctly! According to the above stories, you need to take SSG for only 3 days, 14 days, 11 days or 28 days and the cancer all disappeared. Wow, Malaysians have “beaten” all American scientists at curing cancer with a magic bullet! Part 1: The High Cost of Staying Alive In a Private Hospital. Part 2: Eleven to Nineteen Drugs A Day Could Not Cure Her – Rather Die Than Suffer More. Having seen the scans and medical reports, the first thing I told MM was for her to be ready to accept the reality of the situation. Based on the medical reports, I do not see any chance to cure her at all. Even the oncologist had told MM that at best further chemotherapy would only prolong her life by a few months. So facing death is a reality and we have to accept that. I then posed another question to MM. In this case, do we really want to prolong MS’s (patient’s) life at all cost? At this juncture I remember what I have read. Dr. James Gordon, clinical professor of Georgetown University School of Medicine, (in Manifesto For A New Medicine) said, Death … needs to be addressed differently. If we do not fear it quite irrationally or regard it as our own enemy, we would be unlikely to reflexively mobilize extraordinary and extraordinarily dehumanizing and debilitating technological measures to prolong lives of patients who are clearly dying. Instead of acting out of blind instinct to preserve life … at all costs, we ought … to devote our time, energies and resources to spending time with dying people and their families. Richard Reoch (in Dying Well) wrote, We often make the mistake of trying to keep a dying person alive as long as possible, no matter what the cost. There are many occasions when the kindest thing to do is not to hunt for “better medicine” or a “better doctor” but to be close to and supporting the person who is dying. Let them know that you are glad for all the time, the joy and sorrow you have shared … In the last hours, love and acceptance will do far more good than medicine. Dr. Bernie Siegel (in Peace, Love & Healing) said: It is important that we realize that we can never cure everything. We will never find … cure for all the diseases. Dying can be a healing, ending a full, rich life for someone who is tired and sore and in need of rest. I offered MM three options and requested her to go back and discuss with her sister or her family members in Indonesia. 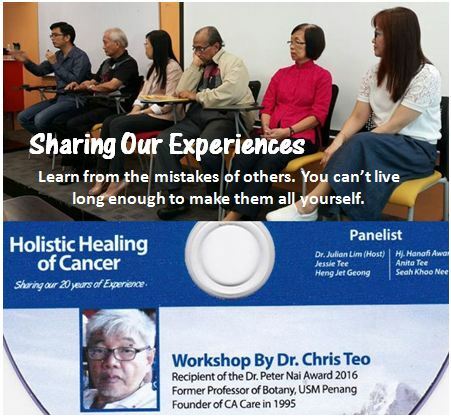 Continue with medical treatment in Penang – do whatever the oncologist wanted her to do. Take her home to Indonesia without anymore treatment. Stay in the hospital but stop further medication from the hospital. Take herbs, i.e., follow the CA Care therapy. However, I made it clear to MM that the decision as to what to do next must be hers. She had to take the risks and assume all the consequences, especially if she wanted to take option 3. I made it clear that I cannot be held responsible for whatever happens after taking the herbs. Her sister might just die – I don’t know! MM decided not to continue with any more chemotherapy. And it is also not possible to bring her sister home right now because of her weak condition – she would not be able to stand the journey home. So Option 3 seemed to be the only way out. Let her sister stay in the hospital but take our herbs. When her condition improves, prepare to take her home quickly. The time frame – give CA Care Therapy a try for one or two weeks. It was indeed a brave decision for each of us to make! Within the next three weeks (from 15 October to 8 November) we wrote 175 emails to each other. Let me reproduce just a few emails to give you an idea of what eventually happened. 3. Area on upper abdominal and gastric pain. 5. Some redness – allergy that I observed maybe due to the vitamin and milk infusion. It had already been stopped since yesterday. But still the redness persists but lesser than yesterday. 6. Hard to relax and cannot sleep well. 19 October 2012: After taking your herbs since yesterday 3 p.m. – started with Pain Tea, I observe that she had already passed motion three times, which is in my view is good. Not watery but soft. She passed out urine many times. Pain became lesser a bit but still hard to breathe. The liquid come out from the pig tail is lesser. Yesterday it came out around 850 ml. This morning it is only 150 ml. I have already discussed with the doctor in hospital that we cut off all infusions given to her previously including albumin, vitamin and the other drips. Any other issues I shall inform you later. Hope she responds well with the herbs. Thank you for your kind attention. 19 October 2012: She can sleep quite well now. She felt and looked very tired. Her first bowel motion started at 12.30 a.m. Back to sleep again and suddenly around 3.30 am she woke up and wanted to vomit. Nothing out only saliva, nausea. Is the process of taking the herbs like this? As I know that having diarrhea is one of taking the herbs. How about the nausea? So far, I observe her overall condition is ok. She is still very weak, her legs swelling, tummy bloated, tiredness of the back (often asking for massage). One more thing – she can turn left and right and without complaining. Before turning her body makes her tummy pain. No complaining of pain now. The redness due to allergy still on her legs, lesser though. She took all your herbs yesterday according to your prescription without any single medicine from the hospital. 19 October 2012: Since last night she still passed out stools. She cannot sleep well yet. She just told me now that her heart beats so fast since yesterday noon. Her hands and feet are cold. She cannot eat and drink much at this moment, even though she has no nausea anymore. She always feels very full. Does the inability to eat and drink much at this time affect her heart beating faster than usual, the tummy full (not hungry), and at the same time she should take too many herbs in a day? Her tummy looks smaller than before. Her feet are still swollen. The liquid came out was getting lesser to 600 ml yesterday. I took a picture of her while she was lying down. Kindly ask your advice based on her update condition. Reply: 21 October 2012: The big question that you need to answer is only this: After stopping the doctor’s medication and going on herbs — IS she better or not? I expect life is going to be difficult for the first one or two weeks. Is it worth it? Or do you prefer to go back to the old ways and put in all the 13 to 16 drugs that the doctor gave. You have to decide. I don’t know if her situation is better or not, so I cannot say anything on that. Look at her condition – before and after the herbs – which one do you prefer? If you see a glass with water but it is not full with water …you can say it is a glass half full of water or you can say it is a glass half empty … this represents two different basic attitudes and perspectives… I don’t know which she belongs to. 22 October 2012: I can assure you that she is much better after stopping the doctor’s medication and going on herbs. Day by day there is improvement. Though she still feels the body heavy, legs swelling, hard to close her eyes to sleep because she feels there is much energy, though walking exercises makes her tired easily. Her passing of stools is lesser day by day. Since yesterday she passed out only 2 times passing stools. Today she has not had one yet. Passing urine is quite ok. Her liquid comes out around 600 ml per day. Her tummy is smaller than before but still swollen. Her pain is lesser day by day. No nausea. Her tummy still makes sound of water flowing. She has stopped all doctor’s medication since the first time taking on your herbs until now, including all infusion of albumin, vitamin and no more asking for morphine Injection. Has she passed through the healing crisis? We plan to go back end of this month or early of November and continue with your herbs. Kindly need your advice. 22 October 2012: She told me she feels she is getting better and better even though she can hardly move freely. She feels heavy. She just moved her bowels. The doctor just came in and checked on her. He surprised to see her very fresh, and no more complain of pain and nausea. So he cut off the medication for nausea (which I have already done so without his knowledge). 23 October 2012: I notice in this few days, there are some red spots on her arms. What are those red dots? Since this morning, she started to feel no energy and power, lazy and is slow to respond if we ask something. She does not know what to do. Confuse. No energy and power to turn her body to left and right. Her face looks tired and sleepy. I think she lose her weight again…only bone and skin. If I ask her, Are you ok? Her answer is, I don’t know “. She sweat quite a lot. 23 October 2012 at 9:45 PM: Ok. Let see what surprises she will show us in the next few days. Right now, her body frozen, cannot move, do not know what is going on, do not know what to do. (Note: At this point on receiving this email, I thought the patient’s time is up. There is no more hope. Tonight night, I did not want to check my mail again after reading this. I just wanted to have a good night sleep, expecting to be told the next morning that she is gone. But the next morning it was a great relief to receive this email). 24 October 2012: She has no cold, no fever. Her blood pressure and temperature are ok. Breathing is still ok. She feels her body heavy and stiff, uneasy to move and turn left and turn right compared the day before which she felt a lot energy. 25 October 2012: Her pains is lesser compared to yesterday. She still cannot tell if her stiffness has improved or not compared to yesterday. I tried the e therapy, Detox 2 for her at 10.30 am today. She still has nausea. It comes and goes. Is it also one of the side effects of the 50 mg Durogesic patch? She can eat half bowl of vegetable soup afterwards and rest for a while but after half an hour she feels the nausea again. Most of the time she is stayed lying down. How about the therapy for her tonight? Is it ok for her to eat a bite or two kuih pasar (contained of coconut covered with flour)? Today is the third day. She still feels lazy, no energy to talk, and weak. 26 October 2012: This morning woke up at 5.30 am and I gave her a little bit Naturex to drink, and help her to sit up in her chair closet to pass urine. After that I try to make her calm and relax by explaining that she is still in healing crisis and hope the condition will get better afterwards today or tomorrow because she is afraid of her condition had weaken and she has no energy this week. One thing that her nausea is getting lesser after the Durogesic patch is reduced to 25 mg. But, she feels a little bit pain on her abdomen. Seems she can bear the pain. If she cannot bear it, I plan to give her only Pain Tea whenever the pain comes. What do you think of this situation? Do you think the sodium level dropped? Or anything on your mind? Anyway, let see again later after she wake up. I will keep you informed. 26 October 2012: If it is found that she lacks of electrolytes and need infusion, can I still give her the herbs during infusion? Yes, she is still easily tired, lazy and no energy till now, she cannot sit too long and she feels uncomfortable for the whole body. Terrible she said. She still feels hard to swallow. Every time she eats and drinks make her nauseous so that is why she does not drink water. The liquid (from her abdomen) comes out yesterday. It was only 450 ml. Lesser. A lot of blood clots came out. Thanks a lot for your advices all this time, guiding me what to do. 27 October 2012: Around 9 a.m. this morning, I gave her the therapy for Anxiety and before the program finished she was already wanting to sleep. Succeeded to make her sleep even for only half an hour. 1. Still weak, lazy, no energy, tired easily. 7. Tummy still bloated even lesser day by day. 8. No passing stools yet only passing gases. 9. Passing urine only one or two times. The colour is also yellow dark. Yes, I believe her condition will get better in these few days. 27 October 2012: Doctor is curious because her stomach is getting smaller, the fluid also did not come out too much. No complain about pain anymore and no nausea after the Durogesic patch was decreased to 25 mg. So, the doctor plans to take the blood test on Monday to check her cancer marker and will do ultrasound to see the tumour inside. Do you think this Monday is the appropriate time to check as her condition is still weak and the red spots are still there along her arms? What do you suggest? 28 October 2012: The results of ultrasound showed not much liquid inside. The size of the tumour is still the same. Some tumours spread to spread out but still in the tummy. Sounds bad? Doctor will give her 1 pack of blood transfusion tomorrow morning, and keep giving her sodium infusion until Friday. On Wednesday, she will take the blood test again to make sure the platelets, sodium, Hb , etc., are ok before we go back. She is still weak with no energy, but she can swallow better than yesterday. She is very moody today and ask to go home already. She continues taking the herbs. 1. Her chest pain – the feeling of something pressing the chest. 2. Her difficulty to swallow. Doctor found out that her throat has a lot of white fungus. 3. Her cocyx pinched so even after we cover it with duoderm, she still feel the pain and uncomfortable. No wound found actually. 30 October 2012: Her condition suddenly changed. She told me at around 5.30 a.m. she passed out stools and urine on the bed. After everything cleaned up, she cannot open her eyes, she is in coma state. It happened for almost one hour and suddenly she woke up by herself and asking to change position for her buttocks. Doctor is going to take the blood test again to make sure that she has the electrolytes she needs at the moment. While in coma, her oxygen level, glucose, blood pressure and temperature were good. The doctor explained to me that the cancer may have spread of to the brain. The cancer had attacked the brain so we should be prepared that she will be in this state on and off. Or it may be also because of low sodium. That is why he arranged to take another blood test just now. He cannot dare to give blood transfusion at this moment as the risky of allergy is high. So, he planned to give her Eprex instead of blood transfusion. Her chest is now bruised because this morning a nurse tried to rub her chest very hard and of course this happen because the platelets are too low. 30 October 2012: Doctor will continue to give platelets, 4 packs today. And sodium chloride. For blood transfusion it is a bit risky because my sister’s antibody is positive. So the doctor said it is a bit risky due to allergy. 30 October 2012 P.M: We change our plan to go back tomorrow night to Jakarta. Doctor suggested to go back as soon as possible. Doctor still gives sodium and we are still waiting for platelets donor. No blood transfusion as the risk of allergy is high. The chance is 50%. Her stomach swelled because I stopped giving her Abdominal Distention tea, only Lower Edema. But this morning I give her Abdominal Distention. After infusion her stomach becomes bigger and the fluid comes out more. She passed out less urine. This morning she passed a lot of stools together with urine. Leg still swelling sometimes looks bigger and sometimes smaller. Doctor suggest to give the blood transfusion in hospital in Jakarta, because if giving now may be afraid of allergic reaction such as swelling on face, arms and redness. Afraid we cannot go back this Friday. 30 October 2012: Yes. Thank you doctor. I will keep the pigtail (tube from her abdomen) to Jakarta, as the internist doctor in Jakarta whom we have already contacted was also suggested that we keep the pigtail. Yes, I have got the tickets back to Jakarta tomorrow night. My brother and sister will come tonight to help me bring her home. She is now having the platelets transfusion, 4 packets. During the day, she has no complaints of pain or anything. She is just calm, alert and silent. I only give her Capsules A, C, and D. After we get back to Jakarta, we will continue giving her the herbal teas. Thanks a lot for all your kind attention, support and good cooperation. I will keep communicating with you and and updating her conditions. 3 November 2012 (in a hospital in Jakarta): Good morning. Since yesterday night 7 p.m., she had to struggle to drink water. Until this morning, she has not eaten anything. She is still continuing the sodium concentrate 3% (2nd bottle) and amino acids (2nd). She told me last night that she felt getting worse, she couldn’t even open her eyes, her body has no energy, and now it is really hard to swallow. What do you think of it? What we can do? Is there any solution for her esophagus? So we stop the herbs at this moment cause her difficulty to swallow. Need your advice. 4 November 2012: Dear Dr. Chris, with this email, I would like to inform you that she has already left this world today at 18.30. Since this morning, she is very calm and peaceful. Thank you very much for your kind attention and assistance during this period. Kind regards. 8 November 2012: Good morning. This morning my beloved sister will be cremated at 10.00 a.m. May her rest in peace. Would I Take On Such A Case Again? Perhaps I was sticking out my neck out too far. But I agreed to take on this case because at that point in time, I felt inside me that this unfortunate lady desperately needed my help. And I had to do it. Would I do this again? Probably never again, unless I hear a loud thunder from heaven asking me to do so! I just wonder what would happen if this story ended up differently, would I be made a scapegoat? Would they say that I kill the patient by giving her herbs and not the doctor’s medication? You can never guess the fallout from this case and what others may accuse me of. But I remember telling MM this, I may not be able to help your sister because her case is way beyond me, but I may be able to help you – the one who is still living and not sick. Perhaps the experience you go through with CA Care can help you in some ways in the future. On reflection, did CA Care make a difference in this case? Make your own conclusion! Cast your first stone if you may. Throughout my career in medicine, I have always had great respect for my patient’s opinions and have advocated using whatever it took to give patients the best results. I come to understand that there is more than one way to effectively treat patients. If Western medicine did not have the right or best answer, I was free to search for a better answer. When we integrated Chinese and Western medicines, the battle against disease had a much greater chance of being won. The efficacy of Chinese medicine can rival that of Western medicine – and for many chronic illnesses, Chinese medicine is actually more effective and a better choice. The strength of Chinese medicine comes from three thousand years of treating illnesses and promoting health. On Mon, Oct 15, 2012 at 11:18 a.m., the patient’s sister, MM, wrote me this email. I saw your website accidentally this morning. I tried to search about the other ways of giving treatment to cancer patient whom doctor has already given up after giving chemotherapy treatment for 7 times. The first and second chemotherapy were given every 2 weeks. The third was given weekly 3 times and fourth chemotherapy given 2 cycles. 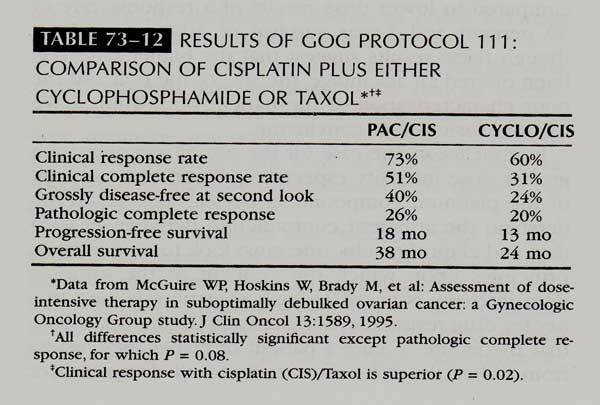 The last 2 cycles of 4th chemotherapy showed the CA 125 (CA 19.9) increase … Based on these lab tests, the doctor suggested to stop using the same chemotherapy drug and change to other drugs. This is to be done on 16 October, and stressing that the drug is not for curing but only for prolonging life. After discussing with family, I plan to go for herbal and found your website. At the same time, we are now staying at XYZ Hospital, Penang. So, I already tried to make an appointment with you this Friday at 3 p.m. and shall bring all medical report of the patient. For your information the patient is my youngest sister. Reply: If you are in Penang, come and see me tomorrow at 10.30 a.m. Go to www.cacare.org and you see map in there. No need to bring the patient, but bring all medical reports. I don’t think you need to do the chemo tomorrow yet. Wait until you come and see me first. MM wrote, She is very weak, hard to walk and sleep, her tummy getting bigger of the tumor cancer and liquid inside. Actually I would like to ask your opinion about the need to continue the next chemotherapy which doctor said is not meant to cure only to prolong life. The next chemotherapy is tomorrow on Tuesday. Reply: I don’t think you need to do the chemo tomorrow yet. Wait until you come and see me first. Chris. The initial chemo treatment cause both CA 125 and CA 19.9 to drop drastically. But that did not mean much. After more chemo, these markers started to rise again. And it was at this stage that the oncologist told the patient’s sister that the treatment did not work. She needed to go for more chemo using other drugs. Or she could just go home – and go ahead and take herbs if she would like to do so! Do You Need Tumour Markers to Tell You That Patient Was Getting Better or Worse? 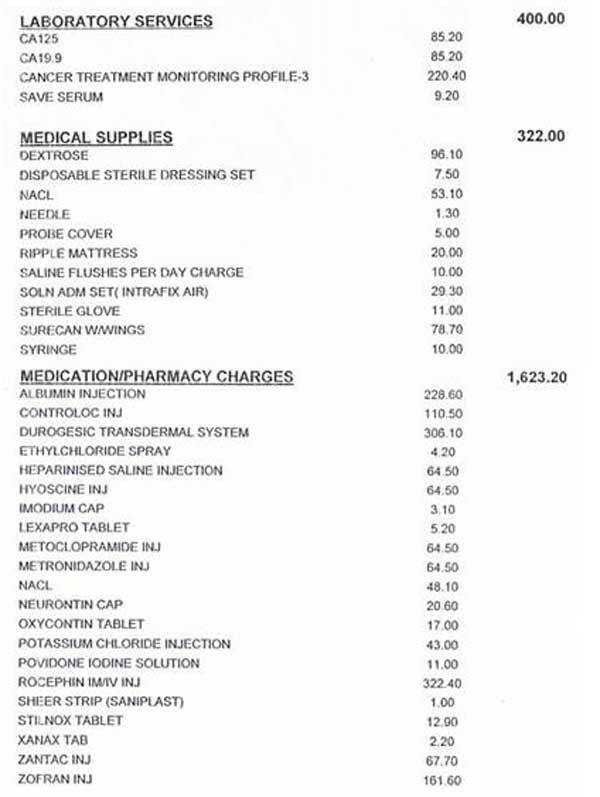 Based on the medical bills, MM was given the following medications while in the hospital. Albumin Injection Lack of albumin in the body Allergic reactions – fever and chills, rash, nausea, vomiting, hypotension. circulatory failure, cardiac failure, pulmonary edema, bronchospasm. Buscopan or Hyoscine inj Abdominal cramps Breathing difficulties, constipation, dry mouth, eye or eyesight problem, faster heart rate, dizzy, lowered blood pressure, confusion, reduced sweating, skin hypersensitivity, urinary retention. Carboplatin Chemo drug for cancer Short of breath, rapid heart rate, trouble concentrating, easy bruising, unusual bleeding, purple or red pinpoint spots under your skin, fever, chills, body aches, flu symptoms, sores in your mouth and throat, stomach pain, dark urine, clay-colored stools, jaundice, numbness or tingly feeling in hands or feet, hearing or vision problems, low magnesium (confusion, uneven heart rate, jerking muscle movements, muscle weakness or limp feeling, nausea, vomiting, loss of appetite, tired feeling. Chlorpheniramine Allergies, itchy, sneezing Fast or uneven heart rate, mood changes, tremor, seizure (convulsions), easy bruising or bleeding, unusual weakness, short of breath, urinating less than usual or not at all, dizziness, drowsiness, dry mouth, nose, or throat, constipation, blurred vision, feeling nervous or restless. Controloc Acid reflux Most serious: allergies – hives, swelling or closing of air passages and throat. Less serious: flatulence, stomach upsets, diarrhea , insomnia. Dexamethasone Anti-inflammatory, immunosuppressant steroid Acne, dry skin, thinning skin, bruising or discoloration, slow wound healing, increased sweating, headache, dizziness, spinning sensation, nausea, stomach pain, bloating, muscle weakness,vision problems, swelling, rapid weight gain, severe depression, seizure (convulsions), bloody or tarry stools, coughing up blood, low potassium (confusion, uneven heart rate, extreme thirst, increased urination, leg discomfort, muscle weakness or limp feeling), dangerously high blood pressure (severe headache, blurred vision, buzzing in your ears, anxiety, confusion, chest pain, shortness of breath, uneven heartbeats), sleep problems (insomnia). Diphenoxylate / atropine (Lomotil) Diarrhea Stomach pain or bloating, diarrhea (watery or bloody), numbness of hands or feet, depressed mood, confusion, fast heart rate, urinating less than usual or not at all, drowsiness, dizziness, headache, tired or restless feeling, nausea, vomiting, upset stomach, loss of appetite, skin rash, or itching. Dormicum Sedative Gastrointestinal disturbances, changes in libido, skin reactions, anterograde amnesia (selective memory loss), depression, restlessness, agitation, irritability, aggressiveness, delusion, rages, nightmares, hallucinations, abrupt withdrawal of Dormicum may provoke seizures. DURAGESIC patch Pain Slow heart rate, weak or shallow breathing, sighing, severe drowsiness, confusion, extreme fear, unusual thoughts or behavior; feeling like you might pass out, dry mouth, nausea, vomiting, constipation, headache, drowsiness, tired feeling, white patches or sores inside mouth or lips. Eprex Anemia, bone marrow to produce red blood cells Hypertensive crisis, brain problems or seizures, nausea, deep vein thrombosis – this may be fatal, diarrhea, flu or flu-like symptoms including fever, jointpain, musclepain or tenderness, pulmonary embolism – this may be fatal, skin rash, vomiting, heart problems, oedema of the extremities. Heparinised Saline injection Anticoagulants, prevent blocking by blood clots Unexplained nosebleeds, bleeding from gums when brushing teeth, red or dark brown urine, bloody or black stools, rash, itching, hives on the skin, swelling of the face, lips, tongue or other parts of the body, shortness of breath, wheezing or trouble breathing, fever, chills, runny nose, watering eyes, vomiting, nausea, itchy soles of the feet. A-Hydrocort Allergic reactions, arthritis, blood diseases, breathing problems Headache, nausea, vomiting, dizziness, insomnia, restlessness, depression, anxiety, unusual moods, increased sweating, increased hair growth, reddened face, acne, thinned skin, easy bruising, tiny purple skin spots, irregular or absent menstrual periods, skin rash, swollen feet, ankles, and lower legs, vision problems, eye pain, muscle pain and weakness, black, tarry stool, unusual bleeding. Intaxel inj Paclitaxel (India), chemo drug Decrease of blood cells, Numbness, tingling or burning of hands and feet, Increased blood pressure (severe headache, blurred vision, buzzing in your ears, anxiety, confusion, chest pain and shortness of breath, uneven heartbeats), Seizure, pale skin and unusual weakness, Fever, chills, body aches and flu symptoms, Joint and muscle pain, swelling, redness, skin color, mild nausea, vomiting, diarrhea or hair loss. sleep problems (insomnia).LexaproAntidepressantConstipation, Insomnia, Dizziness, dry mouth, headache, nausea, exhaustion, Hallucinations, irregular heartbeat, panic attack, allergic reactions, seizures, stomach pain, deteriorating depression, mood change, irritability, severe insomnia, breath shortening, fatigue.Lignocaine InjectionDisturbances in the heart’s rhythmNausea, drowsiness, mental/mood changes, ringing in the ears, dizziness, vision changes, tremors, numbness, headache, backache, fever, unusually fast or slow pulse, trouble breathing, seizures, chest pain, allergic reactions – rash, itching, swelling, dizziness, trouble breathing.MetoclopramideHeartburn, nauseaTremors or shaking in of arms or legs, uncontrolled muscle movements in face, slow or jerky muscle movements, problems with balance or walking, stiff (rigid) muscles, high fever, sweating, confusion, fast or uneven heartbeats, depressed mood, thoughts of suicide, hallucinations, anxiety, agitation, jittery feeling, trouble staying still, swelling, feeling short of breath, rapid weight gain, jaundice, seizure (convulsions), feeling restless, drowsy, tired, or dizzy, headache, sleep problems (insomnia), nausea, vomiting, diarrhea, urinating more than usual.Morphine Sulfate InjectionPainMost serious: respiratory depression. Dizziness, lightheadedness, drowsiness, upset stomach, vomiting, constipation, stomach pain, rash, difficulty urinating, fainting.NeurontinEpileptic and seizuresDizziness, drowsiness, weakness, tired feeling, nausea, diarrhea, constipation, blurred vision, headache, dry mouth, loss of balance or coordination, increased seizures, fever, swollen glands, body aches, flu symptoms, skin rash, easy bruising or bleeding, severe tingling, numbness, pain, muscle weakness, upper stomach pain, loss of appetite, dark urine, jaundice, chest pain, irregular heart rhythm, feeling short of breath, confusion, nausea and vomiting, swelling, rapid weight gain, urinating less than usual or not at all, new or worsening cough, fever, trouble breathing; or rapid back and forth movement of your eyes.OxycotinPain killerConstipation, nausea, drowsiness, dizziness, itching , vomiting, dry mouth, weakness, sweating, loss of appetite, insomnia or abnormal dreams, fever or chills, abdominal pain (stomach pain), diarrhea , indigestion, or heartburn, nervousness, anxiety , or an unusual pleasant feeling (euphoria), shortness of breath, twitching, hiccups, slow heart rate (bradycardia), difficulty passing urine, low blood pressure (hypotension), slow or irregular breathing, ringing of the ears (tinnitus).OxyNorm (oxycodone)Opioid painkillerItching, nausea, vomiting, dry mouth, headache, sleepiness and drowsiness along with dizziness and euphoria (extreme happiness and feelings of well-being), difficulty passing urine, constipation, upset stomach, loss of appetite, slow body movements or tiredness, insomnia, disorientation, low blood pressure, rapid heartbeat, vision problems, hiccups, shortness of breath, fast or deep breathing, confusion, nervousness and anxiety or hallucinations and hypothermia (a drop below the normal body temperature), facial flushing, rigid muscles and nervousness as well as difficulty swallowing, edema (swelling) of the legs, ankles and feet.PanadolPainAllergic reaction – hives; difficulty breathing; swelling of your face, lips, tongue, or throat, nausea, upper stomach pain, itching, loss of appetite, dark urine, clay-colored stools, jaundice, liver and kidney damage.SpironolactoneFluid retention (edema), low potassium levels in the bloodMild nausea or vomiting, dizziness, headache, gas, stomach pain, numbness or tingly feeling,muscle pain or weakness, slow, fast, or uneven heart rate, feeling drowsy, restless, or light-headed, urinating less than usual or not at all, shallow breathing, tremors, confusion, nausea, upper stomach pain, itching, loss of appetite, dark urine, clay-colored stools, jaundice, severe skin reaction — fever, sore throat, swelling in your face or tongue, burning in your eyes, skin pain, followed by a red or purple skin rash that spreads (especially in the face or upper body) and causes blistering and peeling.StilnoxInsomnia and brain disordersHeadaches, nausea, vomiting, dizziness, anterograde amnesia, hallucinations, delusions, altered thought patterns, difficulty maintaining balance, euphoria and/or dysphoria, impaired judgment and reasoning, when stopped, rebound insomnia may occur.XanaxAnxiety, depressionBlurred vision, headache, memory problems, trouble concentrating, sleep problems (insomnia), swelling in your hands or feet, muscle weakness, lack of balance or coordination, slurred speech, upset stomach, nausea, vomiting, constipation, diarrhea, increased sweating, dry mouth, stuffy nose, depressed mood, thoughts of suicide or hurting self, unusual risk-taking behavior, decreased inhibitions, no fear of danger, confusion, hyperactivity, agitation, hostility, hallucinations, feeling like passing out, urinating less than usual or not at all, chest pain, pounding heartbeats or fluttering in chest, uncontrolled muscle movements, tremor, seizure (convulsions) drowsiness, dizziness, feeling tired or irritable.ZantacUlcers in stomach and intestinesDrowsiness, dizziness, sleep problems (insomnia), nausea, vomiting, stomach pain, diarrhea, constipation, chest pain, fever, feeling short of breath, coughing up green or yellow mucus, easy bruising or bleeding, unusual weakness, fast or slow heart rate, problems with vision, fever, sore throat, and headache with a severe blistering, peeling, and red skin rash.ZofranNausea and vomitingDiarrhea or constipation, weakness or tired feeling, fever, headache, dizziness, drowsiness, blurred vision or temporary vision, short of breath, fainting, fast or pounding heartbeats, slow heart rate, trouble breathing, anxiety, agitation, shivering, feeling like you might pass out, urinating less than usual or not at all. The average patient in a hospital today is placed on half a dozen drugs simultaneously. How some of these chemicals react with each other is anybody’s guess. 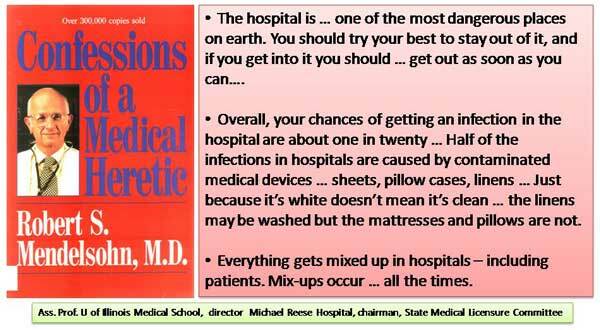 Moreover, a significant percentage of drug doses in hospitals involve errors: wrong drug, the wrong patient, the wrong dose, the wrong time …. 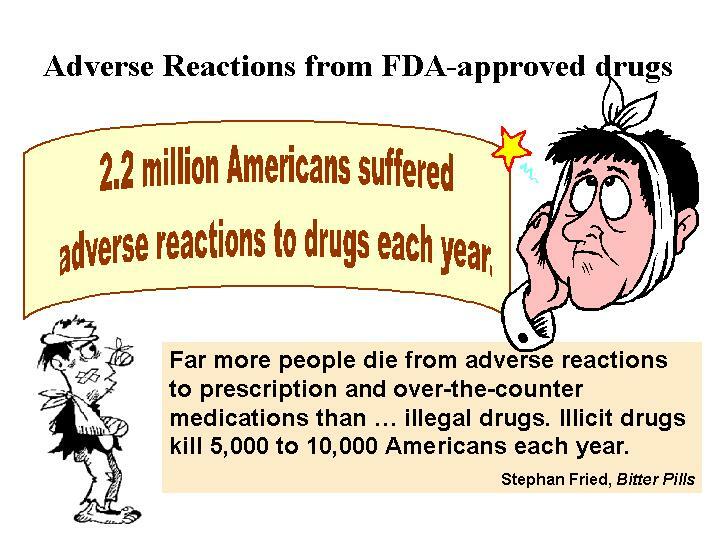 Adverse drug reactions are the leading variety of iatrogenic illness (iatrogenic illness is caused by the effects of medical treatment by the doctors). Voltaire penned this magnificent snipe: Physicians pour drugs of which they know little, to cure diseases of which they know less, into humans of which they know nothing. 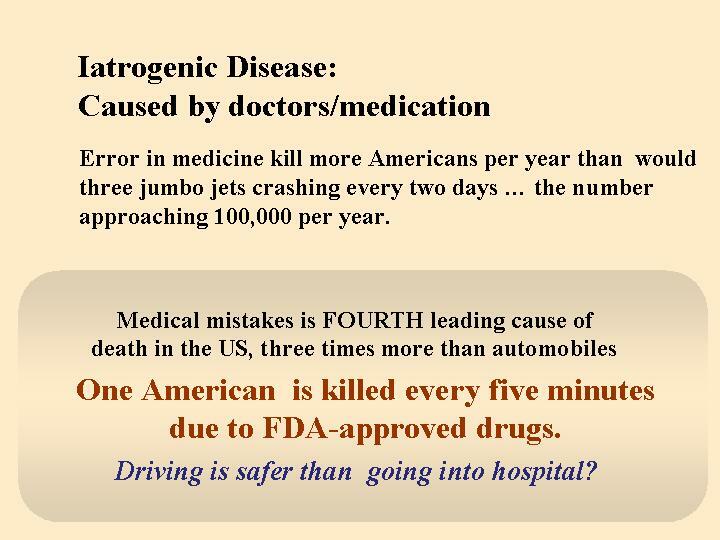 The excesses of drugging in allopathic medicine are one of its worse sins. I find allopathic medicine glaringly deficient in theory and philosophy of any sort … they have no clear conception or theory of what disease is, nor any general concept of treatment. We understand – the doctors in the hospital were trying their best to help the patient. They did what they knew based on what they were taught in medical school. 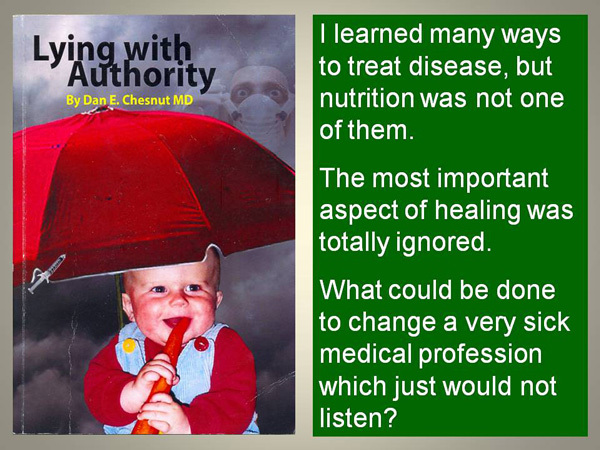 But Dr. Weil – a Harvard trained medical doctor concluded that:I find allopathic medicine glaringly deficient in theory and philosophy of any sort … they have no clear conception or theory of what disease is, nor any general concept of treatment. Why did he say such a thing against his own profession? Let me venture to explain. Take a critical look at the table of medications above again. MM was given 11 to 19 drugs (either orally or infusion) each day while in the hospital. What do these drugs do while in the body? It is anybody imagination! And what is the purpose of each drug – trying to “repair” the damage caused by another drug? 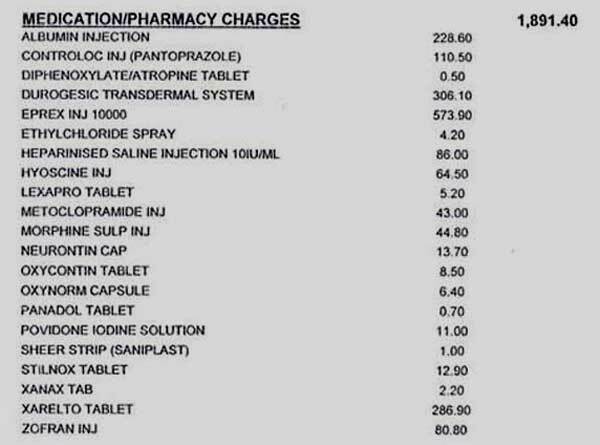 Table 4: Patient received 11 drugs on an ordinary day – 6 October 2012. Three types of pain medication – Durogesic patch, Oxycontin, and Oxynorm. Two types of anti-depression and anxiety medication – Laxpro and Xanax. Medication to prevent blood clot. Medication for nausea and vomiting. Medication for low potassium in blood. Medication for insomnia or sleeping pill. Why did she need 11 drugs a day? Why did she need albumin every day? Where did the albumin go to after infusion each day? Ask this question: If you give these medications (11 to 19 types of drugs) a day to any healthy person– what do you think would become of that person? Would he/she not go ko-ko? Study the various side effects that can be caused by each drug received by the patient. Let’s take albumin injection for example. She was given this injection almost every day for the past one and a half months. This injection may give rise to various side effects such as allergic reactions – fever and chills, rash, nausea, vomiting, hypotension. So she has to take medication for nausea and acid reflex, for example, to take care of the side effects of albumin infusion. But this is not all. There are 10 more drugs that she was taking and all of them have side effects. For example, she took 3 types of pain killers – Durogesic patch, Oxycontin, and Oxynorm. The possible side effects of these drugs are: Slow heart rate, weak or shallow breathing, severe drowsiness, confusion, extreme fear, unusual thoughts or behavior; feeling like you might pass out, dry mouth, nausea, vomiting, constipation, headache, tired feeling, dizziness, itching , sweating, loss of appetite, insomnia or abnormal dreams, fever or chills, abdominal pain (stomach pain), diarrhea , indigestion, or heartburn, shortness of breath, twitching, difficulty passing urine, low blood pressure (hypotension), slow or irregular breathing, slow body movements or tiredness, disorientation, low blood pressure, rapid heartbeat, vision problems, shortness of, nervousness and anxiety or hallucinations and hypothermia (a drop below the normal body temperature), facial flushing, rigid muscles and nervousness, difficulty swallowing, swelling of the legs, ankles and feet. 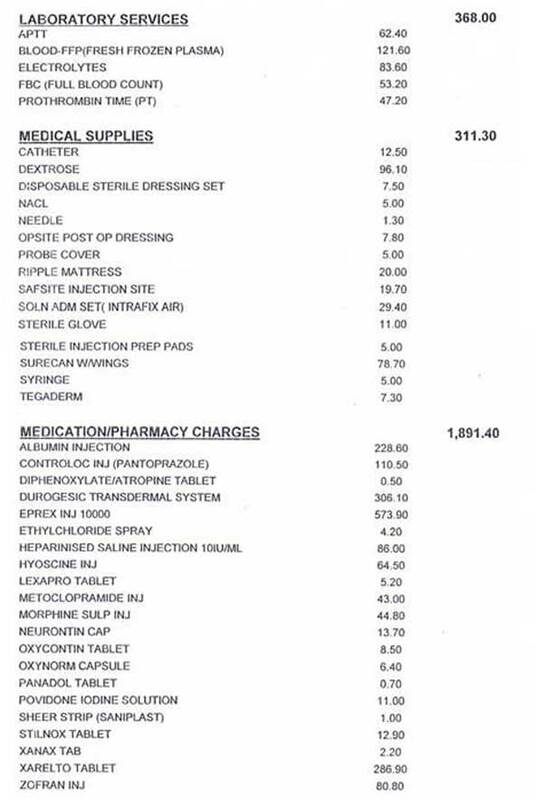 Looking at the list, is there any wonder that the patient was asked to take two types of anti-depression and anxiety drugs and one type of sleeping pill? Again, these three drugs – anti-depression / anxiety and sleeping pills, would by themselves bring on more side effects. So the list of side effects grows and grows. 5. Some redness of allergic that I observed maybe from the vitamin and milk infusion. Is this what Dr. Weil was trying to tell us when he wrote: The excesses of drugging in allopathic medicine are one of is worse sins? 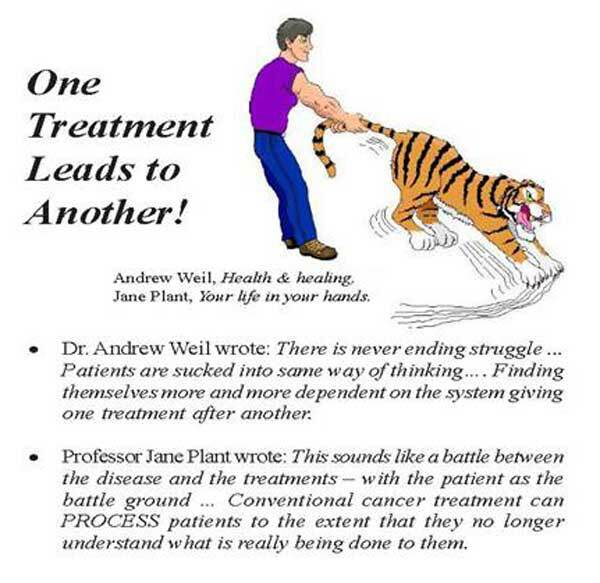 To Professor Jane Plant, this sounds like a battle between the disease and the treatments – with the patient as the battle ground! Dr. Weil also said this: Adverse drug reactions are the leading variety of iatrogenic illness (iatrogenic illness is caused by the effects of medical treatment by the doctors). 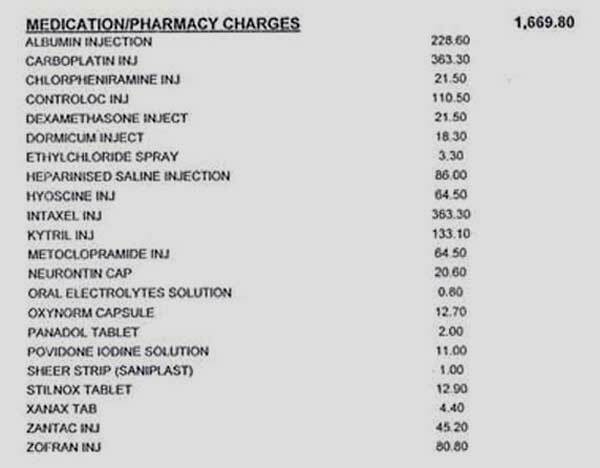 The question we would like to ask is: To what extent are the drugs given to patient causing the problem? In other words, are her problems caused by cancer or by the drugs that she was asked to take? What is the aim of all these medications? Just to keep the patient alive? What are the medications that would improve her health and make her healthy? Is there hope that she would be able to come out of this staple diet of medicines and become normal and healthy again? What is the philosophy of the treatment? Often we hear, Your cancer can be treated! Yes, it is possible to treat the patient by giving her medications but where is the cure? Dr. Weil said it out again loud and clear: I find allopathic medicine glaringly deficient in theory and philosophy of any sort … they have no clear conception or theory of what disease is, nor any general concept of treatment. As a conclusion, let me be clear. I am not here blaming the doctors. They have done their best in wanting to help and save life but unfortunately they have to operate within their medical system, which unfortunately is still stuck in a quagmire. Ovarian Cancer: “After chemo, 99 percent of cancer will be gone!” Do you believe that? How much truth has to be told? SK came to see us on10 August 2012. This 64-old, Indonesian lady looked frail and timid and did not seem to know what was going on. Her abdomen was distended like a pregnant lady. She handed us her CT scan report (dated 9 August 2012). There is left pelvic mass, measuring 5.3 x 3.6 x 3.6 cm, in keeping with dermoid cyst. There are multilobulated soft tissue lesions in the pelvis – the largest measures 4 x 2.7 cm. There are multiple peritoneal nodules. Impression: Likely ovarian carcinoma with moderate ascities, associated with peritoneal, omental and mesenteric metastases. The gynaecologist suggested surgery and this costs RM 16,000. SK came to seek our advice. We told SK to go ahead with the surgery. There is NO way the herbs can help her with such an advanced stage cancer. The tumours have to be removed first, then she can come and take the herbs. On 24 August 2012, SK came back to see us again, accompanied by her daughter. SK had undergone a surgery – TAHBSO (Total Abdominal Hysterectomy and Bilateral Salpingo-Oophorectomy ) with omentectomy + appendectomy. She was hospitalised for five days. 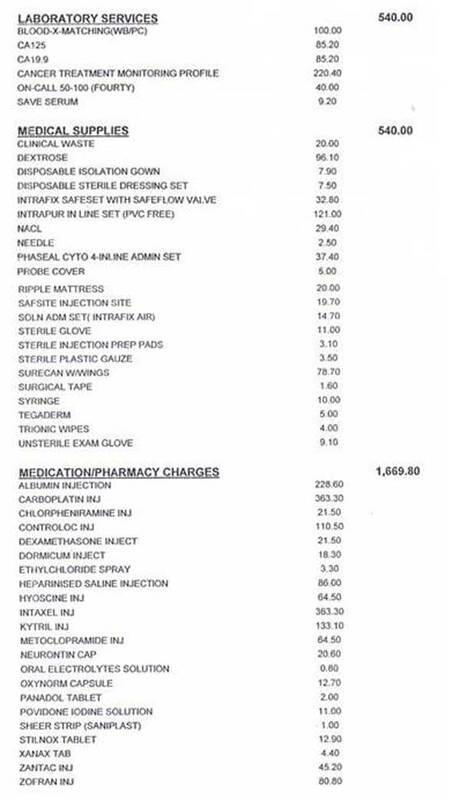 She had the surgery at another hospital where the cost of the operation was only RM 12,800. SK felt better after the surgery. It was a Stage 3B cancer. SK was asked to return to the hospital on 25 September 2012 for chemotherapy. She and her daughter consulted an oncologist and below is an account of what happened during their meeting. Chris: What did the doctor want you to do after the operation? Daughter: Must do chemo – six times. I asked the oncologist if this can kill all the cancer cells in the body. He replied very confidently – Definitely, 99 percent of the cancer cells will be gone. C: He said 99 percent will be gone? You asked him that? And this is his answer? Did he really understand your questions? D: Yes, he understood me. I asked him if chemotherapy is the only best option for my mother. He said: Chemo is the only option – there is no other way. C: You asked him in Bahasa Indonesia or in English? D: In English – the cancer cells will be gone? Will it be 100 percent gone? He said: 99 percent gone. C: Meaning, 99 percent can cure? C: How many times did you ask him this question? D: Two times. He was so sure about what he said. He said: Yes, you do six times of chemo, 99 percent of the cancer will be gone. C: When you asked him this question – did he get angry? C: For six chemos, how much do you have to pay? D: RM 3,000 each time. I also asked him if the treatment is going to be painful. He said: No, not painful at all. C: Oh, chemo is not going to be painful? That is going to be good! D: But he also said there will always be some side effects. There will be loss of hair and nausea. Then mama asked the doctor: Will I be strong enough to withstand the chemo treatment? The oncologist said: Sure, you are strong enough for the treatment. C: How long did you talk to the oncologist? D: About 15 to 20 minutes. And he said: Go back home and eat whatever you want – KFC, McDonald and anything. C: Oh, you can eat KFC, McDonald and also anything? C: What else did he tell you? D: Cannot take herbs while on chemo. You cannot mix – chemo and herbs. Only after completing six times chemo, then we can take herbs if we want to. C: How much did you pay for talking to him? C: After he said chemo will give you a 99 percent cure and then you can eat anything you like when you go home, do you believe him or not? D: I really want to believe him! C: Go home and think carefully what you want to do now. Did you mother understand what you and your doctor were saying? C: Don’t worry. I understand. It is a difficult situation. Everyone who come here are really lost. Don’t worry. It is okay to cry. What is important is that after the surgery your mother feels better now. The doctor asked you to do chemotherapy – do you want to do that? It is difficult for me to say what you should do – to go for chemo or not to go for chemo. But what the doctor told you – to eat what you like when you go home – that is not right. My advice is – Don’t eat anything that walks or has legs! Also avoid oil and sugar. Please listen to my advice. Again, other than that, whether you want to do chemo or not, I cannot say anything. The doctor said you can’t take herbs while on chemo – that is also not true. Many of my patients take herbs while they are on chemotherapy. They came out better – they felt better. But I am not going to ask you to believe me. If you believe your doctor, go ahead and believe him. Have you read or really understand what chemotherapy is? D: I have heard about it from other people. I saw people going for six times of chemo and they never come back (die). 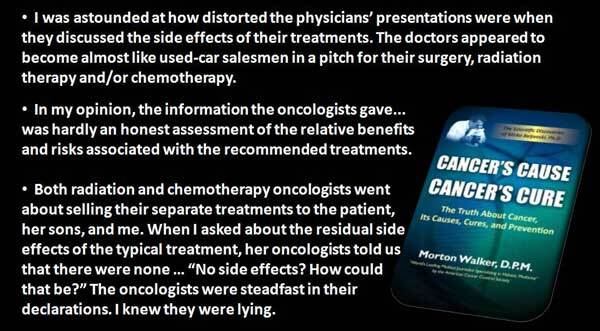 C: Honestly, tell me – when the oncologist said there is a 99 percent cure after the chemo – do you really believe him? D: (shaking her head) No. C: Ibu (mom), when you go home please take care of your diet. Take time and go for exercise. Don’t just stay home and think too much about your problem. That will not be good for you. Try to be happy always. You are a Christian? Pray to God for help and guidance. God knows that you are sick. Pray that you have the strength to overcome this. You may want read a related story: Cervical Cancer: Eighty-nine Percent Chance of Cure Vanished With the Collapse of Her Right Lung Four Months After Radiotherapy and Chemotherapy This patient underwent radiotherapy and chemotherapy. She was told that there was a 89 percent chance that she would be cured. However, barely four months later the cancer recurred. Cancer Patients – Eat anything you like! At CA Care we say this is not right! We are not alone in this. Read what some outstanding doctors in the US said about the importance of diet and cancer. Most ovarian cases are diagnosed in an advanced stage and their prognosis is closely related to the stage at diagnosis. Overall, prognosis for advanced-stage patients remains poor. Overall 5-year survival of ovarian cancer is 45 percent. 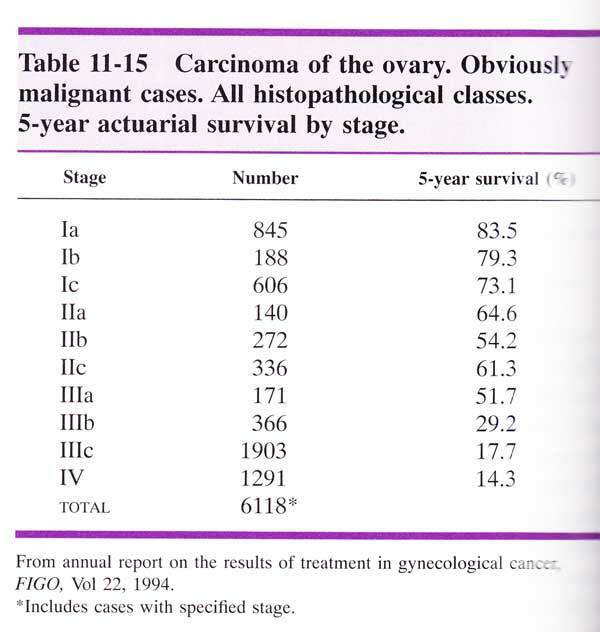 In the case of SK, who has Stage 3B, the 5-year survival is about 29 percent (Table below). Source: DiSaia, P.J & W.T. Creasman. Clinical Gynecologic Oncology, pg. 298, Mosby. Over the past two years, some patients came to CA Care for help after medical treatments have failed them. Unfortunately, we did not get to see most of these patients after one or two visits. We are not sure what had happened to them. The cases below will portray the reality of ovarian cancer. Compare the facts of these cases with the readily available information found in the internet above. Case 1: H297 was a 66-year-old female. She was diagnosed with ovarian cancer, Stage 1C. She underwent an operation followed by six cycles of chemotherapy. Three months later, the cancer spread to her liver. She was asked to undergo more chemo. She refused. Case 2: H256, 34-year-old lady, had pains associated with lower abdominal mass in December 2008. She had bilateral ovarian tumours. Her left ovarian tumour invaded the sigmoid colon. There were extensive small nodules all over the peritoneal cavity. The undersurface of diaphragm was also extensively involved by the tumour nodules. She underwent TAHBSO, omentectomy, appendictomy and resection of the sigmoid colon. 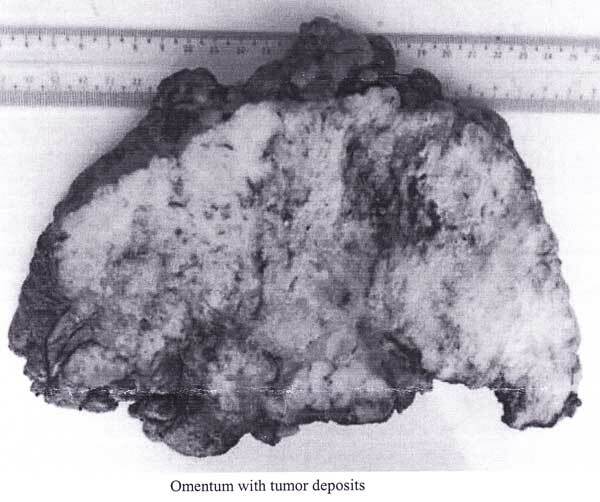 All significant sized tumour nodules were debulked. She received six cycles of chemo – carboplatin + paclitaxel. And this completed in June 2009. A repeat CT scan did not show any evidence of recurrent or residual tumour. Her CA 125 which was in the range of 11,000 pre-op normalised after three cycles of chemo and remained below 10 after that. However, six months later, December 2009, she had severe pains and was hospitalised. There were tumour nodules in her pelvis and she had extensive recurrence of her cancer. Overall her prognosis appears poor. Her surgeon wrote: Nevertheless, I believe we should make one final attempt at chemotherapy. 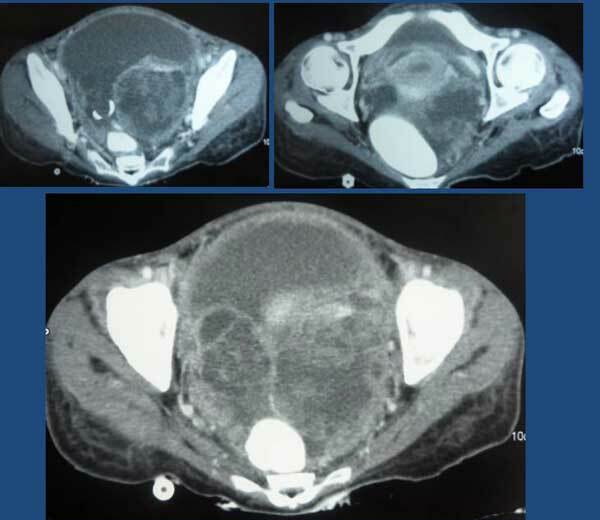 Case 3: H394, 40-year-old lady, underwent an operation to remove a malignant ovarian cyst in 2007. This was followed by a hysterectomy. It was a Stage 3 cancer. Not satisfied, she went to Singapore for consultation. She was told her cancer was a Stage 4. H294 underwent six cycles of chemotherapy with carboplatin + taxotere. In addition she received 25 radiation treatment and 2 brachytherapy (internal radiation treatment). All treatments were completed in October 2007. She was well for a while. But two years later, October 2009, her CA 125 started to increase. A CT scan showed the cancer had recurred and spread. She received another three cycles of chemotherapy with cisplatin. The treatment was not effective. Her CA 125 increased further and the tumour grow bigger by 1 cm. She went to China for further treatment. This too was not effective. Case 5: H284, 50-year-old lady, had ovarian cancer and underwent a surgery – TAHBSO in February 2006. In addition she received 3 times brachytherapy (internal radiation) and six cycles of chemotherapy. Two years later, in September 2008, CT scan showed lesions in her liver and soft tissue mass in her pelvis. Her CA 125 was in a rising trend. In April 2009, she felt pains in her abdomen. A PET scan confirmed cancer recurrence. The soft tissue nodule in her pelvis was 2.9 x 2.6 cm in size. 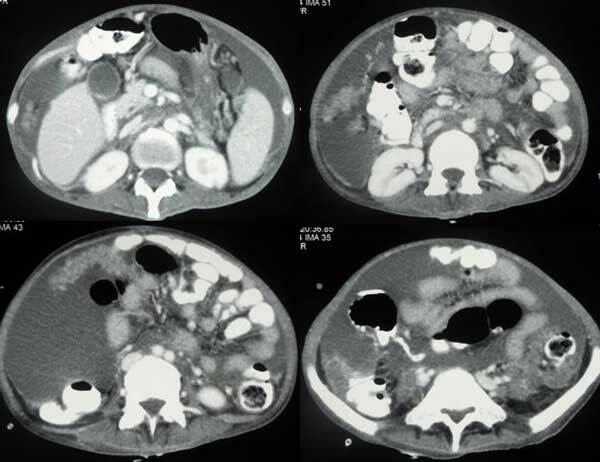 Nodule in Segment 6/7 of her liver was 2.2 c x 2.5 cm in size. She underwent 6 cycles of chemotherapy. The pains were gone but three months later, the pains came back. The doctor said more chemotherapy! Case 6: H813, 54-year-old lady, went for a general checkup. The doctor found something in her uterus. Subsequently she underwent an operation, TAHBSO. It was a Stage 3 ovarian cancer. She underwent 12 cycles of chemotherapy with Gemzar + Carboplatin. All treatments were completed in August 2009. Everything was okay. About two years later, September 2011, the doctor found lesion in her pelvis. In January 2012, CT scan showed the lesion was still there. A biopsy was done and was found to be malignant. She was asked to undergo another 18 cycles of chemotherapy with Taxol + carboplatin. Case 1: Siti was 48 years old when she was diagnosed with ovarian cancer Stage 4. She underwent a total hysterectomy in 2005 followed by three cycles of chemotherapy. She gave up chemo. At first Siti and her husband did not believe in what we at CA Care are doing. Many times, they were “pushed” by a friend to come and see us. Eventually Siti and her husband relented and came to Penang. From then on it was no turning back. Siti’s health improved. It has been seven years now and she is going well. Case 2: June (not real name) was 42-years old when she was diagnosed with ovarian cancer in December 2006. A TAHBSO surgery was performed. The histopathology report confirmed a bilateral ovarian adenocarcinoma with metastasis to the omentum. June underwent chemotherapy and took herbs. Unfortunately the cancer recurred. The doctors wanted her to undergo more chemo. She refused and continued with the herbs. This time June’s spleen became swollen and caused severe pains. She had no choice but to undergo more chem. She was well up to this day. Case 3: GS (T791) is a 54 year-old lady. A cervical biopsy and endometrial curetting indicated a moderately differentiated adenocarcinoma of the endometirum. Subsequently, GS underwent a surgery – TAHBSO at a private hospital. The pathology report confirmed a well differentiated adenocarcinoma of the endometrium, classical endometrioid type, Stage 3B (T2bNxMx), tumour invades into cervical stroma. Case 4: Ella was diagnosed with endometrial cancer. She underwent a TAHBSO and resection of the omentum and left and right pelvic nodes. After the surgery, her surgeon told her: No chemo, you have three months. With chemo, it would be two-and-a-half years. She asked: What? Ella was started on herbs right away – and NO chemo of course. As of this writing, it is about four years now and Ella is well and healthy. 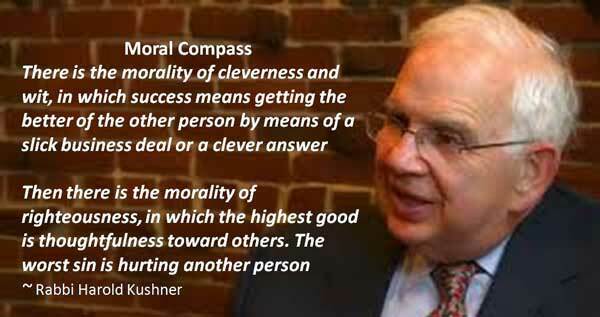 Let me conclude by quoting a wise man who I have much respect for – Jewish Rabbi Harold Kushner. His words have always been my moral compass whenever I deal with patients who come to us for help.